There's something incredibly comforting about baking bread - it's methodical and the tactile sensation of kneading dough can be a wonderful way to release stress. My roommate jokes that this is my angry bread, or what he finds on the kitchen counter in the morning when I'm upset. (His life is hard.) 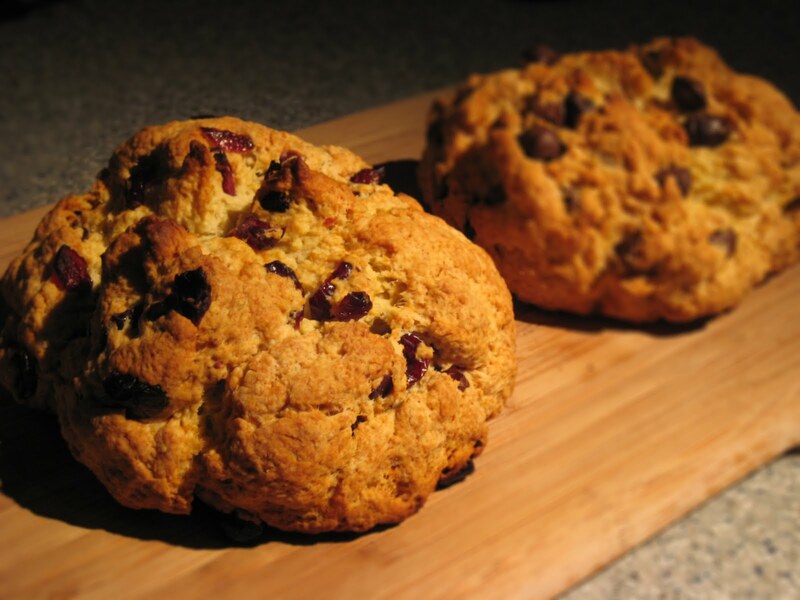 This recipe is a variation on Irish soda bread, with results similar to a scone. Preheat the oven to 400°F. Grease a large baking sheet. In a large bowl, mix the flour, baking soda, baking powder, salt, and sugar. Use a pastry blender to cut in the butter - if you don't have one, a large fork or two knives will work as well - until the mixture resembles coarse crumbs. Stir in the chocolate chips (if you're using dried fruit, soak the fruit in a bowl of hot water for a few minutes, dry, and then stir them in). Add the milk and vinegar, mixing until just combined. Once the ingredients are moist, stop stirring - the bread will become hard if you keep doing so. Place the dough onto a well-floured surface and knead it gently a few times. Divide the dough into two balls and place them onto the baking sheet with a fair amount of space in between. (If you don't want to bake both loaves at once, you can freeze one for later - just wrap it tightly in plastic and place it in a Ziploc bag.) Bake for 15 minutes at 400°F, then reduce the temperature to 375°F and bake for around 15-20 minutes until the bread has turned a nice, golden brown.